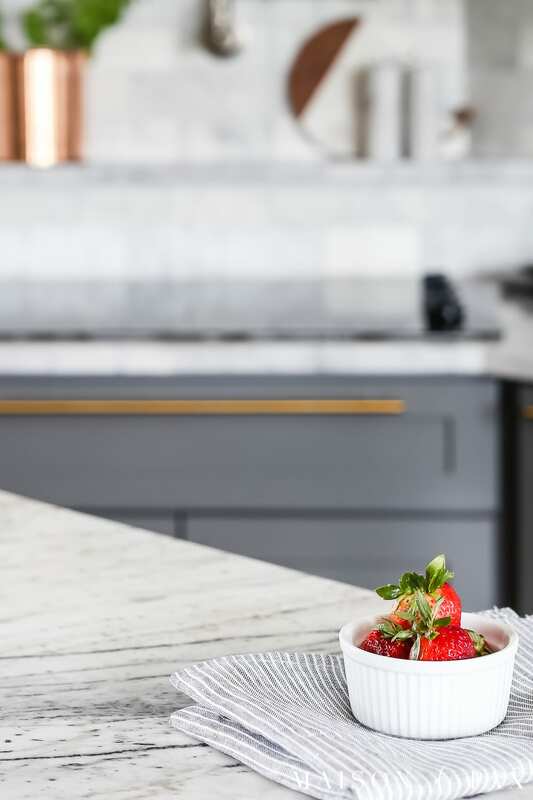 Looking for simple spring kitchen inspiration? 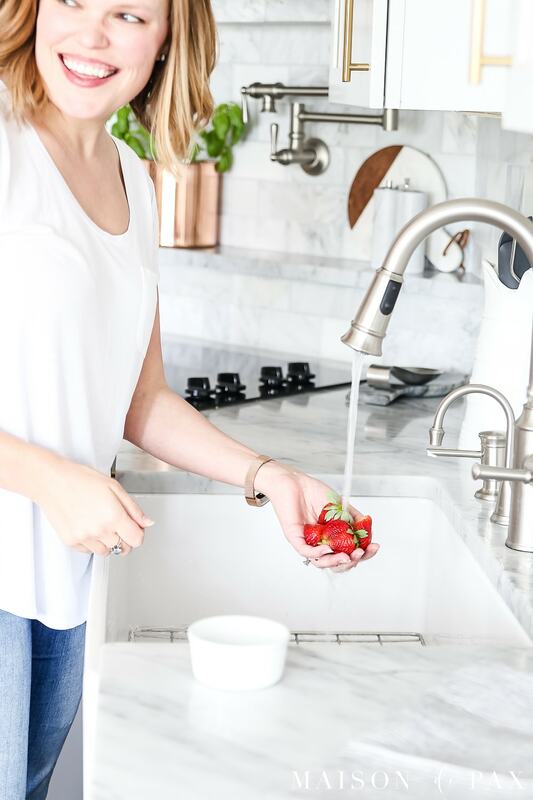 Get quick tips on adding a fresh, clean feeling to your kitchen this spring without having to buy new things. I didn’t decorate my kitchen for spring. Gasp! Isn’t that what this post is all about?!?! Kind of. But this post is also about simplicity. 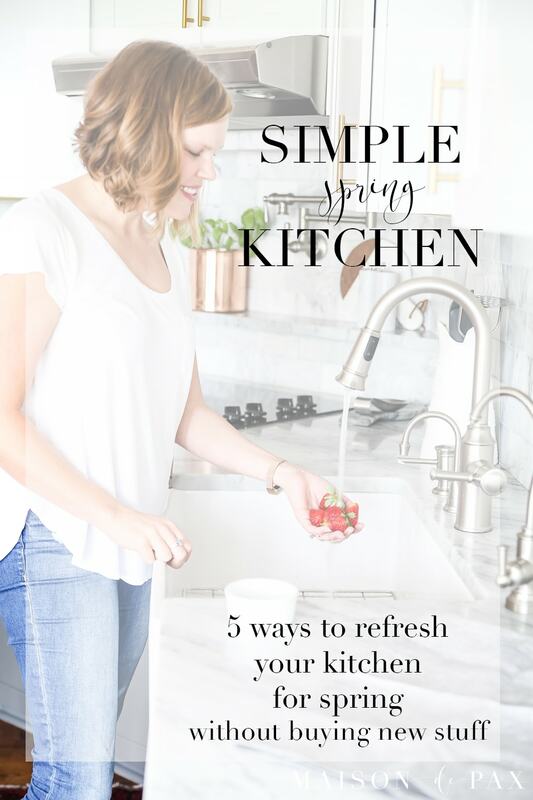 I’m so honored to join my friend Krista from The Happy Housie and so many other talented bloggers for a spring edition of Seasonal Simplicity (be sure to visit them all below!). If you’re visiting from So Much Better with Age, welcome. For whatever reason (maybe it has something to do with four kids, homeschooling, travel, work conferences, baseball, and… you get the idea), actually decorating my home for spring this year didn’t seem so important. I know. Fire me now, right? But hear me out. Just because I didn’t bring in new dish towels or new wall art, doesn’t mean I can’t take a fresh angle and perspective. In fact, I think it was kind of good for me to tackle it this way because I simply don’t need more stuff in my home right now. 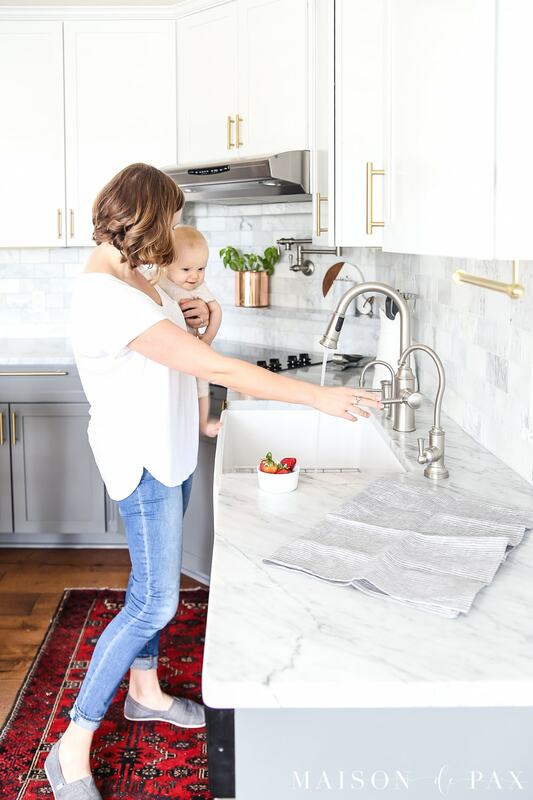 Here are the things that I found helpful in giving my kitchen an easy spring refresh. I’m not sure about your home, but at my house things slowly earn permanent places on our kitchen counters: vitamins, favorite mini appliances (like our little egg cooker), water glasses… But they really do all have a home in nearby cabinets. It only took a few minutes to arrange the cabinets so these items could return to their normal spots and leave our counters open, giving me a clean slate and space to prep the roses and eucalyptus for my Easter table. I am not one for deep cleaning very often, and I confess I didn’t do it right now either… but once the counters are cleared off, it’s important to do a good basic cleaning while you have access, right? You can see all about how I care for my marble countertops here if you’re interested. 3. Reorganize the things that stay on your counters. It’s sometimes the small things that can make a difference. 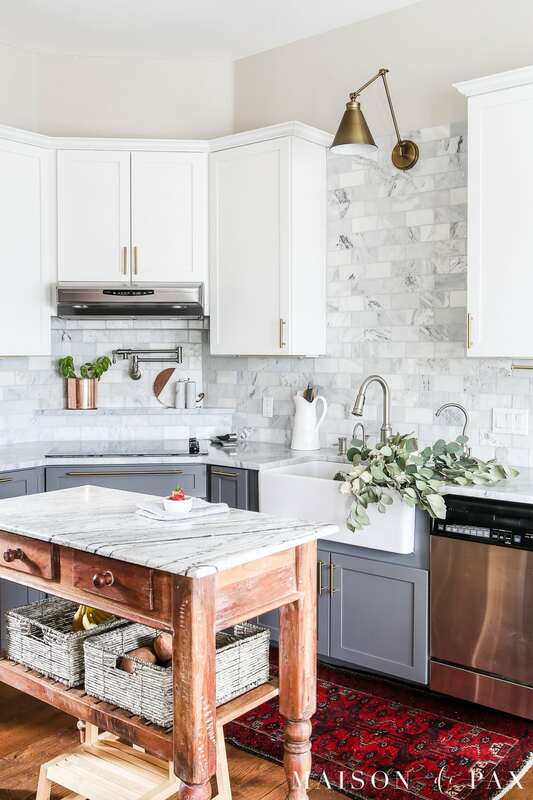 Using a different pitcher to hold my spatulas or putting the pretty marble salt and pepper shakers that my husband gave me for Christmas well within reach can help the space feel fresh and functional. I guess I did purchase one thing this season: a small basil plant from my grocery store which I put in one of my copper canisters. I love to get a fresh basil plant each spring for a few dollars, grow it in the kitchen for a month or so, and then plant it in the garden when the weather is safely past freezing. Easy and a great way to shift my cooking into fresh, lighter meals for the spring. 5. Enjoy the seasonal produce. Speaking of spring foods, I love to bring tons of fruits and vegetables into our home this time of year. They are beautiful and delicious, and they add a touch of color to my mostly neutral space, encourage my family to snack in healthier ways, and make incredibly cost effective decor since we eat it all anyway. 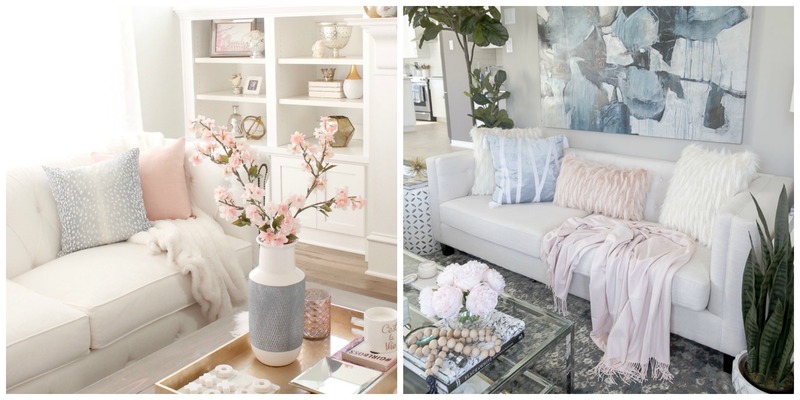 Don’t forget that I’ve teamed up with a talented group of bloggers to share parts of our homes decorated for spring as part of the Seasonal Simplicity Series. You can continue the tour over at my friend Cami’s TIDBITS. I actually had the pleasure of spending last week at a conference with that sweet girl, and I just love her and her home… I’m sure you will, too! There is so much stunning inspiration for you to enjoy, all week long! I agree, sometimes taking things away is better. Love your new haircut! I’m totally with you, Rachel! It’s so refreshing to keep it simple. Your home and photos are absolutely stunning. Great seeing you this weekend! Such a great post, Rachel! It’s so true, I don’t need anymore stuff! Love this friend. And your little one is getting so big! Rachel – I love your sentiments! 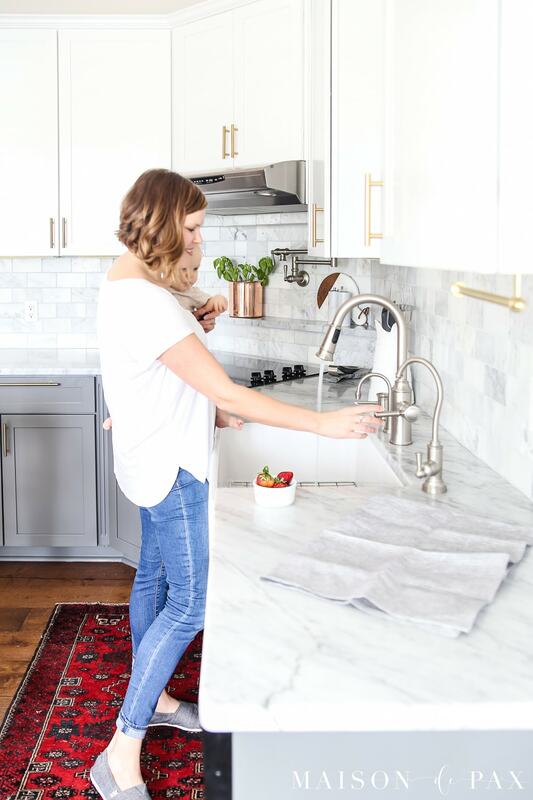 I love your simple ideas to clean out your kitchen and freshen it up for Spring rather than adding! 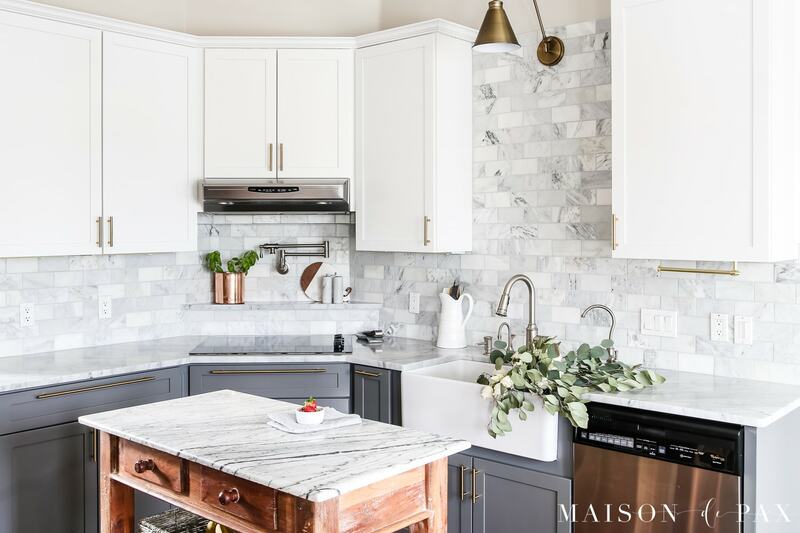 Your kitchen is just gorgeous! Have a great week! You have a beautiful kitchen and thanks for all the tips, i do need some herbs in my kitchen. Your baby girl is growing so fast and so cute. Thanks, Marlene. Small plants make a big difference. Thanks for inviting me, Krista! I just love your kitchen, Rachel! I think it looks perfect just the way it is, spring décor or not and that little one is too cute! Love that! Thank you, Christy! I completely hear you on keeping things simple. Four kiddos sure will do that to you! 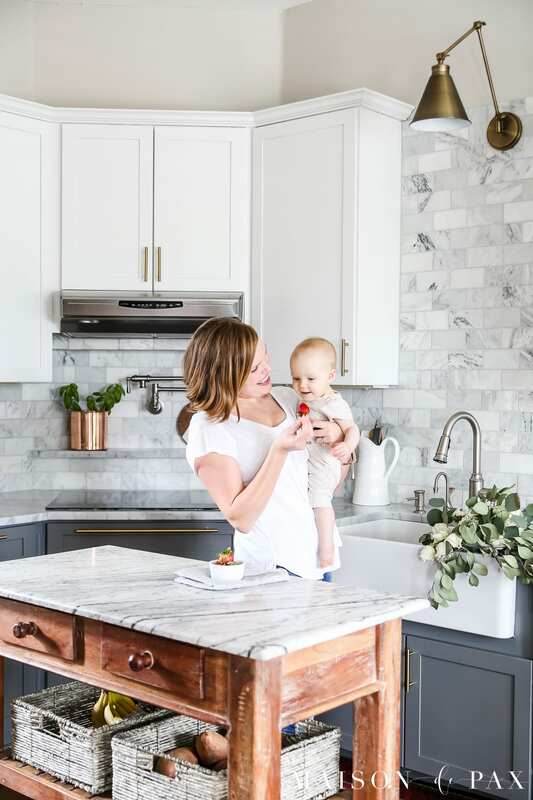 Love this post, and of course, your beautiful kitchen!! Thank you, Laura! It’s always a challenge to keep things simple, but I’m grateful when I do. I agree Rachel, that the counters can get cluttered. Especially when you have five grandkids, sleepovers and a smaller home. Love the kids being over, but things can get a little messy. Today will be to straighten up everything for the gang tomorrow! Happy Easter! So true, MaryJean! Hope you had a great Easter! 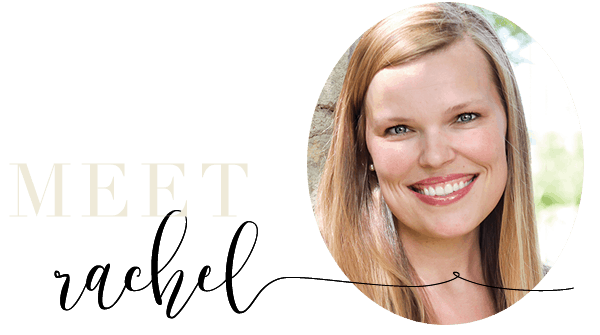 Rachel- beautiful as always…you, your home and the baby!